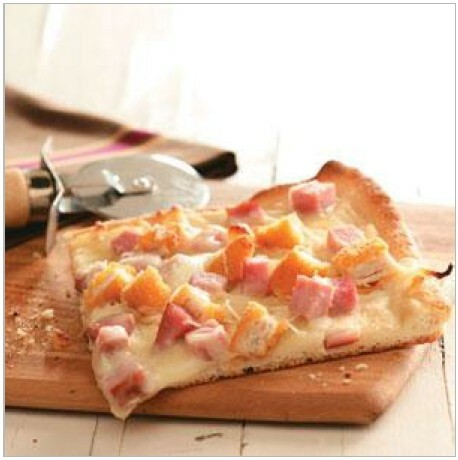 This recipe is a combination of my two favorite foods-pizza and chicken cordon bleu. have made this for my family and also the teachers at my school. Now my teachers ask me to make it for them for lunch! 1. Preheat oven to 425°. Unroll dough into a greased 15x1ox1-in. baking pan; flatten dough and build up edges slightly. Bake 8-10 minutes or until edges are lightly browned. 2. Spread with Alfredo sauce; sprinkle with garlic salt and Swiss cheese.Top with ham, chicken nuggets and mozzarella cheese. Bake 8-10 minutes or until crust is golden brown and cheese is melted. 1 piece equals 460 calories, 21 g fat (9 g saturated fat), 70 mg cholesterol, 1,337 mg sodium, 39 g carbohydrate, 1 g fiber, 28 g protein. This entry was posted in Quick Dish on August 24, 2015 by lonny. A terrific recipe for moms with Young kids and busy lives, this simple, inexpensive dish is made with handy ingredients and takes just a short time. Best of all, kids will go absolutely crazy for these darling dinner bites! 1. 1. In a large skillet, cook beef over medium heat until no longer pink; drain. Stir in the ketchup, brown sugar, mustard and Worcestershire sauce. Remove from the heat; set aside. 2. 2. Press each biscuit onto the bottom and up the sides of a greased muffin cup. 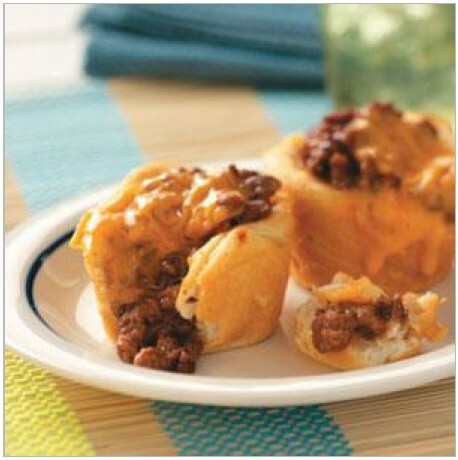 Spoon beef mixture into cups; top with cheese cubes.Bake at 400° for 14-16 minutes or until golden brown. Freeze option: Freeze cooled pastries in a freezer container, separating layers with waxed paper. To use, thaw pastries in the refrigerator for 8 hours. Reheat on a baking sheet in a preheated 375° oven until heated through. 1,142 mg sodium, 45 g carbohydrate, trace fiber, 27 g protein.